The Everlasting Dragon, also called Stone Dragon, is an immortal, mineral-based being which serves as the leader of the Path of the Dragon covenant. 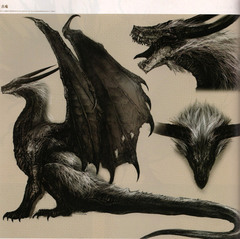 According to Domnhall of Zena, the Everlasting Dragon is said to be the only dragon surviving since the Age of Ancients. Due to conflicting information within the game it is unknown if it is a direct descendant or a true survivor of the surviving Dragon since the Dragon Greatsword states that it actually came from the tail of the stone dragon of Ash Lake, descendant of the ancient dragons. Tomomi: Onward to enemies… Why is the Stone Dragon okay with its tail being cut off? Why doesn't he become hostile? The suspense was thrilling! Compared to the magician brat that doesn't get pissed with the Dark Hand R2, it must really have a heart of gold…! 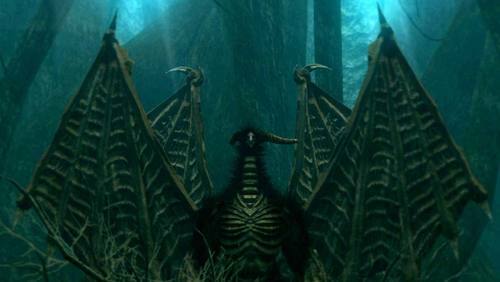 Miyazaki: The Stone Dragon is not alive. The Ancient Dragons are half living, half element. So there's not pain for them. In the opening, it's shown that they were there before there was life, so they don't feel pain, kind of like Akuma Shogun. Miyazaki: You don't get it? I guess the young ones of today won’t understand it! Tomomi: I thought the tail regrows. Tomomi: So it doesn't hurt? From the Kinnikuman series. He doesn’t possess it’s own body, so he doesn’t feel pain. He fusions with Akuma Kishi and builds its body. The bonfire in Ash Lake near the Stone Dragon, called by the same name, is already lit upon arrival and is kindled, like the rest of the bonfires that are linked to living Firekeepers, therefore there is a possibility that the Everlasting Dragon is a Firekeeper. The Stone Dragon is not alive. The Ancient Dragons are half living, half element. So there's no pain for them. when asked about why the Dragon is fine with having his tail cut off. This could mean that it is indeed possible to completely transcend life through the Path of the Dragon. According to the Dragon Eye, "transcendent apostles pray to the ancient dragons. To be alive is to be vulnerable, and the fiery Gods are no exception. The apostles seek another plane of existence, which transcends life". This is "attainable by transformation into an ancient dragon" According to the Dragon Greatsword, the Stone Dragon in Ash Lake is a "descendant of the ancient dragons", thus it is most probably that the Stone Dragon did indeed become a Dragon at some point, maybe the same way the player does; by collecting Dragon Scales and performing ancient rites. Dragon Greatsword This sword, one of the rare dragon weapons, came from the tail of the stone dragon of Ash Lake, descendant of the ancient dragons. Dragon Eye An art of the transcendent apostles who pray to the ancient dragons. To be alive is to be vulnerable, and the fiery Gods are no exception. The apostles seek another plane of existence, which transcends life. Dragon Head Stone Stone imbued with the power of the dragons. Rite of apostles of the ancient dragons. Dragon Torso Stone Stone imbued with the power of the dragons. Rite of apostles of the ancient dragons. Dragon Scale Dragon scale for reinforcing dragon weapons. Peeled from an ancient dragon. A dragon is inseparable from its scales, and the transcendent apostles, who seek the perpetuity of the ancient dragons, have crossed the very end of the earth to seek this invaluable treasure.